No matter how calm Mother Nature may act after the storm, there will always be a significant amount of stress for those who have suffered damage to their homes. At Refuge Roofing & Siding, we provide relief and sanity to homes that have incurred tornado damage. If you are looking for tornado damage repair contractor in Minnesota from the recent tornadoes and storms on September 21, 22 and 23, 2018, let Refuge Roofing & Siding be your first call. We understand the 10 tornadoes covering a big area from Northfield and Cannon Falls, Minnesota south to Waterville and Owatonna, MN. Our Company has the staff to handle the repairs that will be needed before winter arrives. It’s hard to tell what kind of damage took place after a tornado. 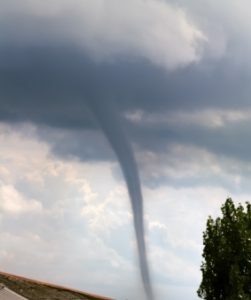 Most of the time, tornadoes cause damage due to the high intensity of the wind. This can cause minimal destruction or it can completely rip a home to shreds. Most damage occurs from the airborne debris that the high winds bring. This can also vary in degree, from lifting an entire home from its foundation to tree limbs landing on the roof of your home. Airborne debris is not only dangerous as it’s happening, but it can be deadly to try and remove from your home without professional help. After a tornado, calling in our professionals is the safest and most efficient way to restore your home. After a tornado has occurred, our team at Refuge Roofing & Siding will work quickly to assess and fix your critical problem areas. We understand the importance of maintaining safety within your home and our professionals due everything possible to get you back into it as fast as they can. Here at Refuge Roofing & Siding, we are a fully licensed and insured local general contractor with many, many years of experience in storm damage and repair. We specialize in restoration work and can restore your roofing, siding, windows, gutters and anything else you can think of that has been damaged. One of the largest stressors after a storm, apart from any safety issues, is worrying about your insurance coverage. Refuge Roofing & Siding will come out to your home before your claims adjuster gets there. We will assess the damage and then meet with the claims adjuster to go over all of your damaged property. Ussaully the claims adjuster will agree with our findings and give permission for work to begin repairing your damage. With Refuge Roofing & Siding, you will never have to pay more than your insurance deductible for tornado damage repair unless you are upgrading your home further. For more information about repairing your strom damaged home and how we can help, contact Refuge Roofing & Siding today at (651) PRO-ROOF.